The Professions: Rohan Harrison, Alexis Henderson, Professor Alan Pettigrew and Craig Milton (11th October 2008). 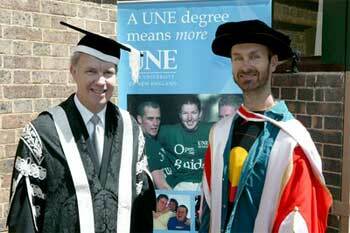 NEA Graduate October 2007: Phil Schubert (Arts, Humanities and Social Sciences and Economics, Business and Law ). 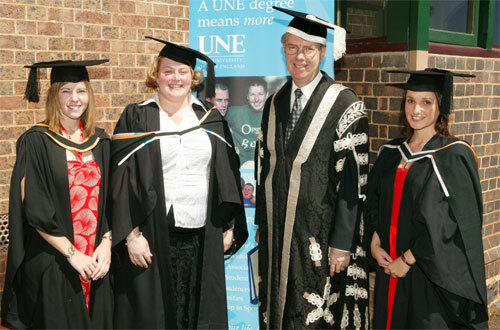 NEA Graduates March 2007: Jessica Atkinson, Mikhaela Gray and Louise Attard (Arts, Humanities and Social Sciences ). 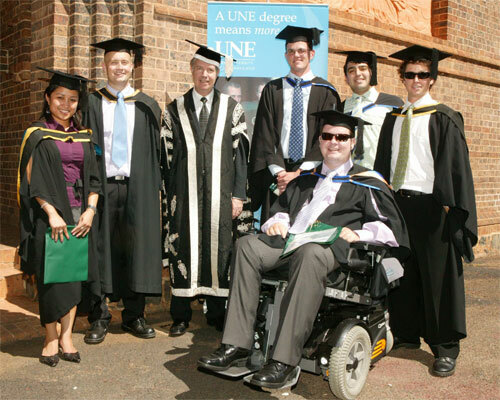 NEA Graduates March 2007 (from left to right): Alison Del Socorro, Giles Dickenson-Jones, Professor Alan Pettigrew (Vice-Chancellor of UNE), Toby Robinson, David Karam, Robert Bebb, James Horsburgh (Economics, Business and Law). 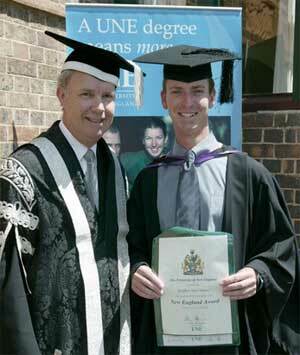 Stephen Manser, NEA Graduate October 2006. 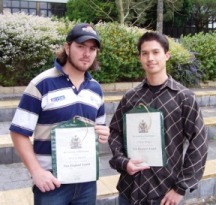 John Southwell, NEA Graduate October 2006. 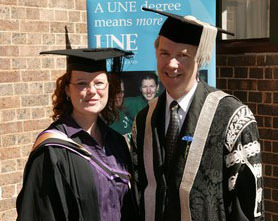 Suzanne Goodear, NEA Graduate October 2006 with Prof. Pettigrew. 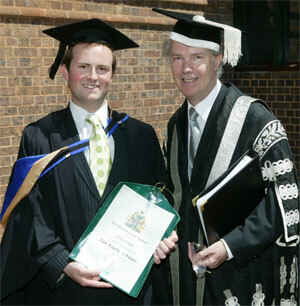 NEA Graduate Marty Branagan with Prof. Pettigrew at the October Graduation 2006. 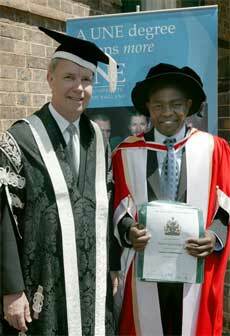 NEA Graduate Andrew Langat with Prof. Pettigrew at the October Graduations Semester 2, 2006. New England Award Graduates with the Vice-Chancellor and CEO Prof. Alan Pettigrew at the Graduation Ceremony on April 8th 2006. "This is a great way to motivate yourself into participating in extra-curricular activities and also a great way to reward yourself for your extra achievements." 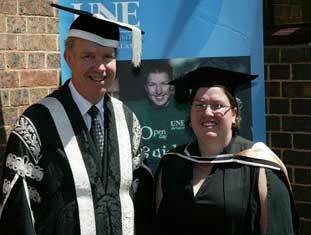 NEA Graduate Kim Wilson with Prof. Alan Pettigrew at April Graduation Ceremony 2006. "The New England Award is not just the physical recognition of extra-curricular activities. It is a management tool, a university experience designer and more often than not an alternative way of finding new and exciting avenues to explore and new hobbies to pursue. 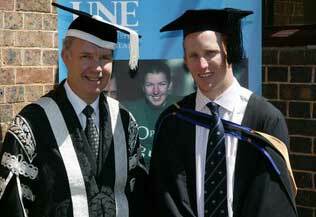 My New England Award has taken me from as far as Vienna (Austria) to inside college itself in Armidale! It is truly a unique experience." 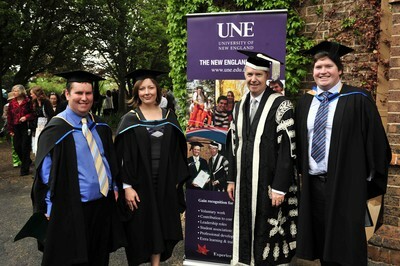 New England Award Graduates with the Vice Chancellor of UNE Prof. Alan Pettigrew at the April 2006 Graduations. "Upon beginning the NEA I realised that many aspects of my life needed improvement. The NEA provided me with the incentive to begin something of importance. I have grown as a person as a result of undertaking the NEA and can now put all that I have learnt in theory to practice now and into the future." Sanjay Robert - NEA Graduate, March 2006. "In summing up my full UNE experience, I would say that although most of the NEA activities may appear peripheral to the study program I was enrolled in, it is now apparent to me that my career pathways have been broadened, my global perspective has been enriched and my approach to social responsibilities has diversified. More importantly, I feel that my involvement in several of the NEA activities has and will continue to inform and empower my sense of self and others in my career life after university. My participation in and engagement with these activities has acted as a catalyst to my realisation of the value of the key attributes of a graduate - a UNE graduate." A. Kiprono Langat - NEA recipient, October 2006. "Working towards meeting the criteria for the NEA meant that I became involved in activities and committees that I may otherwise have not. When I think back on my time at UNE, it is these experiences that I really value." New England Award graduates Ashley Marsh and Jordan Braye. "The New England Award has given me credit for many things that I was already doing and other things that I otherwise probably would not have done. While acknowledging individual pursuits, it also serves as encouragement for community participation. The award serves as proof to employers that there are many facets to being a student." "The New England Award is an innovative and flexible scheme that encourages students to become involved in extra-curricular, community and work-related activities. It rewards those who attend university not just to get a piece of paper, but to develop as human beings:- socially, ethically, and holistically. I can highly recommend it." 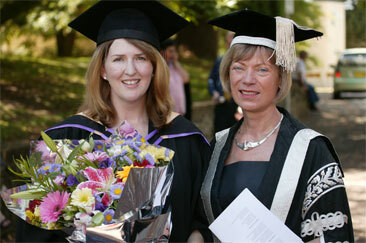 New England Award Graduate Tania Willis with the previous Vice Chancellor of UNE Prof. Ingrid Moses at the April 2005 Graduations.